On this DVD, Grandmaster Roman Dzinzichashvili clearly outlines extremely dangerous lines for black in the Petroff Defence. Evolution of this dangerous line for black is easily explained based on games of the top Grandmasters and careful analysis by Roman. 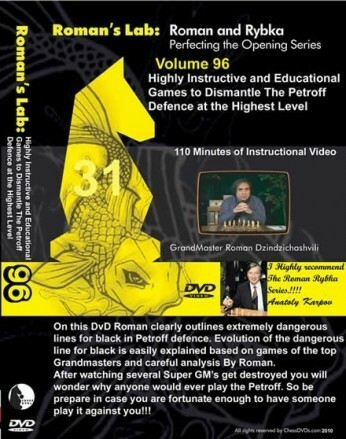 VOLUME 96 - Highly Instructive & Educational Games to Dismantle the Petroff Defence at the Highest Level Grandmaster Roman Dzinzichashvili Over 110 Minutes On this DVD, Grandmaster Roman Dzinzichashvili clearly outlines extremely dangerous lines for black in the Petroff Defence. Evolution of this dangerous line for black is easily explained based on games of the top Grandmasters and careful analysis by Roman.